The schizo-somatic workshops are continuing,the first one of the season with André Fogliano this coming Wednesday, the 19th of September between 3-5pm in the room next to the Senselab. The proposition of this workshop is to move and play with two concepts that capoeira has to offer: ginga and roda. 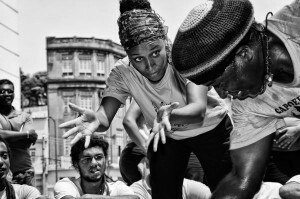 Through these moving-concepts it is possible to experience how capoeira as a anticolonial way of living raised in the undercommons (in portuguese we could call it quilombo) of the colonial plantocracy system of Brazil creates an afrosomatic practice (ginga) that maliciously and fiercely plays against and with – smiling and dancing – the major trends of Brazilian necropolitics body. It’s poetics of relation, it’s rituality sets a zone of contact (roda) in which we might be able to feel and dance intuitively with the minor tendencies, the infra-cracks, the unperceivable cuts that under normapathy conditions we would miss completely. In this sense, perhaps capoeira could be thought as a healing technique which weaves an arena of encounter where it is possible sometimes to choreographically practice the schizz, decolonize our habits, and dance the aesthetics of the sociality of blackness that surrounds us, always. The idea is to work with some very basic movements of capoeira as a lure to compose with it’s potencialities. Please come with a comfortable paints and joy!